Went to Edinburgh this weekend to watch the rugby. Teamed up with a couple of my old Regimental pals, one of whom was Irish. Had a leisurely breakfast in the Craigiehall Mess before easing in to the city to start soaking up the atmosphere; usual routine. As we sauntered along William Street towards Teuchters Bar I turned to my Irish mucker and said, “It’s too quiet O’Reilly, too quiet by half.” It was 11.35 am and there was nobody about. What was going on? My mind raced. Grown men standing in a bar in one of the greatest capital cities on earth, wanting to buy a couple of beers. The city heaving with rugby supporters and other residents and visitors out to soak up the atmosphere and have a good time at a great sporting event. I thought about Scotland’s history and the Declaration of Arbroath … “it is in truth not for glory, nor riches, nor honours that we are fighting, but for freedom – for that alone, which no honest man gives up but with life itself.” I thought of the Scottish National Party today campaigning to have the Scottish people released from the shackles of the English; striving for independence; striving for freedom. I thought of the decades that my pals and I had given in armed service to Queen and country in the name of democracy and freedom. Then I looked at the sign hanging on the beer pumps. 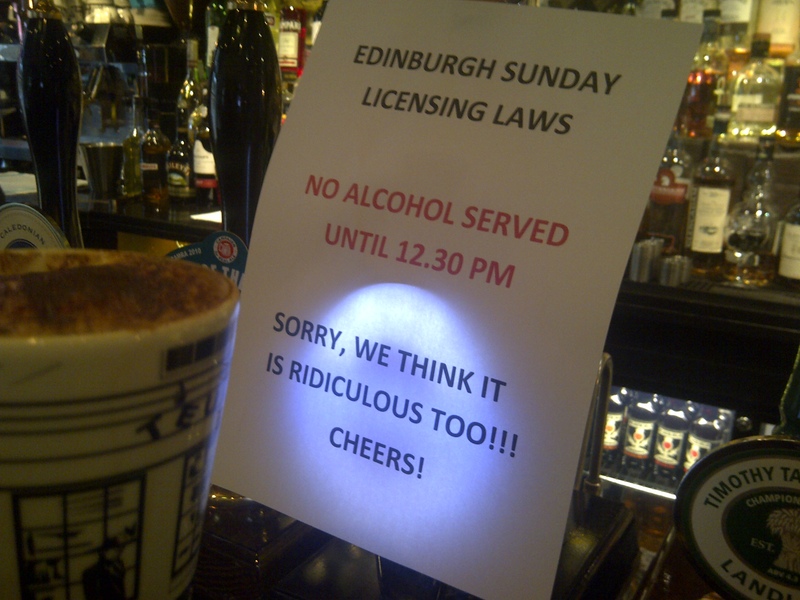 I thought of some petty little officials and ‘elected members’ in Council chambers somewhere deciding that my freedom to have a beer before the rugby at 11.35 am on a Sunday morning should be denied. Then I thought about the matter a little longer and wondered why those same petty little officials and ‘elected members’ didn’t set the deadline as 12.41 pm? Or 12.37 and 49 seconds pm? Why did they decide to deny my freedom to have a beer at 12.29 pm, but allow me to get hammered at 12.31 pm? We ordered cappuccinos. Then, in a supreme act of defiance, O’Reilly pulled out his hip flask and – in full view – poured large slugs of Irish whisky in to each mug of steaming coffee. I fully expected the Stasi-in-Kilts to come crashing through the doors and windows to seize us there and then. But nothing. Just the sound of teaspoons tinkling on china over in the corner as a group of hairy-arsed rugby supporters added sugar to their cuppas. Is it just me, or is the political class always to be treated with suspicion? ← FOR HOW MUCH LONGER WILL ELECTORATES TOLERATE THIS?